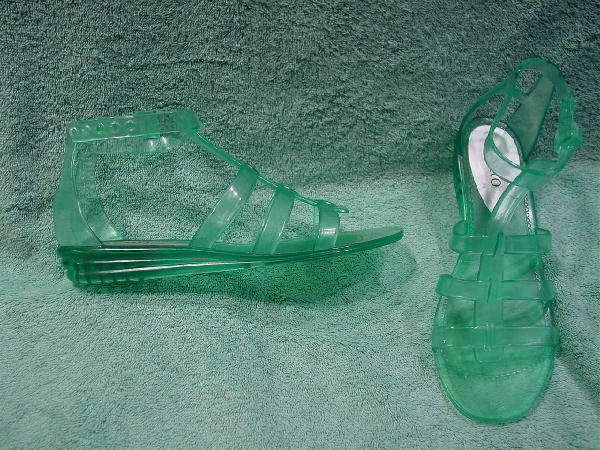 These never-worn manmade light green flexible sandals have ankle straps and mini wedge heels. They have a center vertical strap with 3 horizontal straps. 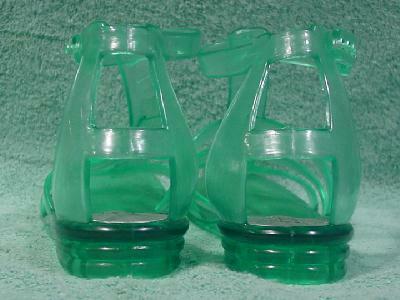 The ankle strap goes through a slot in the vertical strap. The ankle strap (which has 5 holes) goes through a slot buckle and behind the slot are two elevated prongs which fit into the hole. The back has two vertical straps and one horizontal strap. The sandals are by Rialto. They're from a stylist's inventory. She bought these and a blue pair for a swimsuit photo shoot. She wasn't sure which color would work best with the swimsuits. This pair was worn once, for the photo shoot.